"I got the hook-up, holla if ya hear me"
It seems as though the easiest way to get ahead in the world, be it in the workforce or the music industry, is to know someone or have access to the inside (i.e., a hook-up), Many have struck recording deals and are en route to pursuing great careers due to the proverbial hookup. However, many of these artists would not be functional in their current positions without these advantages. While this may be true for many in the industry, such is not the case for the Love Fellowship Tabernacle Choir (LFT). While being the church choir for Pastor Hezekiah Walker's Brooklyn-based Love Fellowship Tabernacle, the choir certainly does not depend upon the sound or reputation of Walker's mainstay, the Love Fellowship Crusade Choir. "It wasn't difficult getting a distinct sound apart from the [Love Fellowship] Crusade choir, " states JoeWorn Martin, LFT's minister of music. "We started with a different sound. It was a combination of folks from different community choirs coming together and jelling." 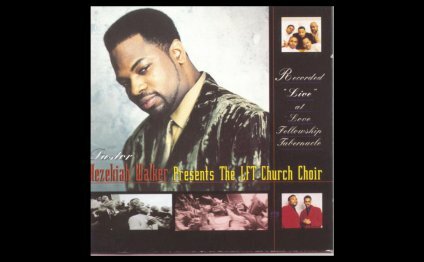 LFT has certainly come out of the blocks fast and furious debuting in the Top 5 on Billboard's gospel charts with their debut release, Pastor Hezekiah Walker presents The Love Fellowship Tabernacle Church Choir. Their first single, "I Will Bless The Lord" quickly became a radio favorite across the country. While most new artists generally seek to reach predefined markets, LFT's target is unique. "Our goal is to put out an album that other church choirs can adapt to. We represent the local church choir. We want to reach local choirs, encourage them, and minister to them, " says Martin. In representing the local church choir, LFT performs a variety of material, including some previously recorded works such as "Sho'Nuff" (originally recorded by John P. Kee's VIP Music & Arts Seminar Mass Choir). "At first, we started with only original material. Then some of the [choir] members started to request certain songs, " states Martin. "We had to sing some commercial material. We really like 'Sho'Nuff' so we put it on the album. Our musicians put a different sound to it, " continues Martin. Great music has never been a difficult product coming from the Love Fellowship Tabernacle. Not only is its pastor one of gospel's premiere artists, but several of its members are artists within the music industry as well. In several circles, the Tabernacle's pastor, Hezekiah Walker, has been dubbed "the hip-hop pastor", housing members such as Sean "Puff Daddy" Combs, SWV, and Lil'Kim, to name a few. However, LFT isn't distracted by the attention or controversy that accompanies this type of publicity. "Most of the artists that come are faithful and supportive members of the church. They don't come for the music, " proclaims Martin. "LFT is trying to be different. People want to see real men and women of God today. The artists that come are looking for salvation." While LFT's church choir is known for its urban flair, they certainly seek to exhibit the diversity that is reflective of a pioneer church choir. "We have enough for everybody. Pastor loves his hymns and we can do that. We even do swing like [James Hall and] Worship and Praise. We can do it all, " Martin says. As LFT's minister of music, Martin is called to have a close working relationship with his pastor. While the relationship between many pastors and musicians are often strained, Martin relishes his relationship with Pastor Walker. "Pastor is like a father, brother, and best friend to me, " states Martin. "We have the best possible relationship that a minister of music and pastor can have. Usually there is a struggle between the two but such is not the case with us." Martin feels that when everyone serves in their proper place, the church can accomplish its mission. "I know that my place is to help the man of God. I'm ordained to be a Kingdom builder." The LFT church choir has gone from being Brooklyn's best kept secret to experiencing overnight success in an extremely short period of time. In addition to being Billboard mainstays and radio favorites, the church choir is currently on tour with the Love Fellowship Crusade Choir. However, Martin is dealing well with this newfound success. "It hasn't hit us yet. We're simply doing what God has told us to do. God has commissioned us to do this work so we're just taking everything as it comes."